A BimlStudio project lets you define all the assets you need to build your BI solution. Click the Empty Project button on the home screen after opening BimlStudio. The New Project dialog will open. Click on the Browse button. This opens the Project Location dialog. Use it to select the folder where the BimlStudio project should be created and then click Select Folder. BimlStudio inserts the selected folder path in the Location textbox. Enter the project name in the Name textbox and press OK. 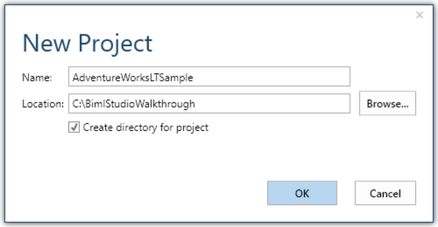 This dialog creates a folder, with the same name as your project, under the Location path. The folder contains the project file and subdirectories for holding Biml files and compiled output. You have now created a project and are ready to add assets.